The Edinburgh International Film Festival (EIFF) has always been a showcase for emerging talent and this year Matt Palmer’s tremendous Calibre was the talk of the festival and ultimately the star of the show. Calibre is not only one of the best films I experienced here at the film festival, it is one of the best films I’ve seen this year. Matt Palmer has created a superb psychological thriller that is as unsettling, exciting and terrifying as some of the genre bests, I am resisting the urge to create a ‘snappy’ headline comparing Calibre to one of my favourite films, Deliverance (another excellent example of a leisure trip spiralling out of control). 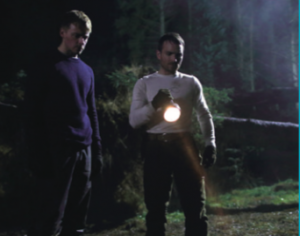 The central characters Vaughn and Marcus, played superbly by Jack Lowden and Martin McCann (both have received Bafta Scotland nominations), have organised a hunting adventure before Vaughn becomes a father. The film is set in the north of Scotland and Palmer creates a taut sense of isolation, a town struggling to embrace change, trying hard to welcome outsiders yet unable to hide the sense of unease this brings. The supporting cast are sensational in Calibre, each part played perfectly, adding to the growing sense of discomfort. There’s a real feeling of tension within the community, something that is further antagonised by out of towners. Although all of the supporting cast are superb I must mention Ian Pirie’s performance as Brian McClay. Palmer creates a taut sense of isolation, a town struggling to embrace change. A towering and terrifying man, angry at the change he is being forced to embrace. The idea of him being let loose on Vaughn and Marcus will send a shiver down your spine. The film moves quickly, a delightful 100 minutes in total, and when tragedy occurs (I’m determined to be spoiler free in these 500 words or so) the film manages to keep you in a continuous sense of unease. The film looks beautiful, using long breathing takes to capture the angst of the situation. The sound design is tremendous too; a particular dinner scene over, a very rare, cut of veal where the sound of cutlery clashing with plate manages to sum up the terror in the situation perfectly. The final act of the film is a heart-pounding 30 minutes of terror and angst. I found myself anticipating, with trepidation, what was coming next, and what else could go wrong, and as the protagonist’s world starts closing in I found myself sitting closer and closer to the edge of my seat. Palmer handles this with real skill, the tension in these scenes is reminiscent of John Carpenter’s masterful Assault on Precinct 13, and as the film builds to its thought-provoking conclusion. I was left shaken and amazed by what I had experienced. Here at the festival Calibre won the coveted Michael Powell Award and it was unquestionably deserved. This is a tough, fascinating, thought-provoking film. I was fortunate to see this on the big screen, being a Netflix release this wasn’t readily available in cinemas. Thankfully, it is equally enjoyable on the small screen and I cannot recommend it enough. NB – Had I tried to create a ‘snappy’ headline I’d have gone with ‘Deliverance in Drumnadrochit’ but even that doesn’t do this superb film justice. Enjoy. *Calibre has been nominated for five BAFTA Scotland awards: Director-Fiction, Writer Film/ Television and Actor Film (all three nominations).